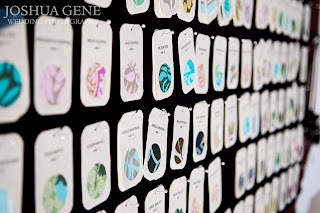 Place cards – This bride found a template to create place cards with a cut out for a swatch of fabric to show through. Each of her twenty-two tables had a 14” square of unique fabric at the center of the table. The fabric in the place card matched the fabric for those guests’ table. Ingenious!! 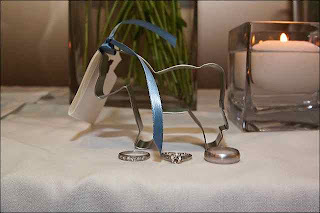 She also added a handmade table number for each table which was also printed on the place card for that table. See the link to get your template and directions for making these place cards. 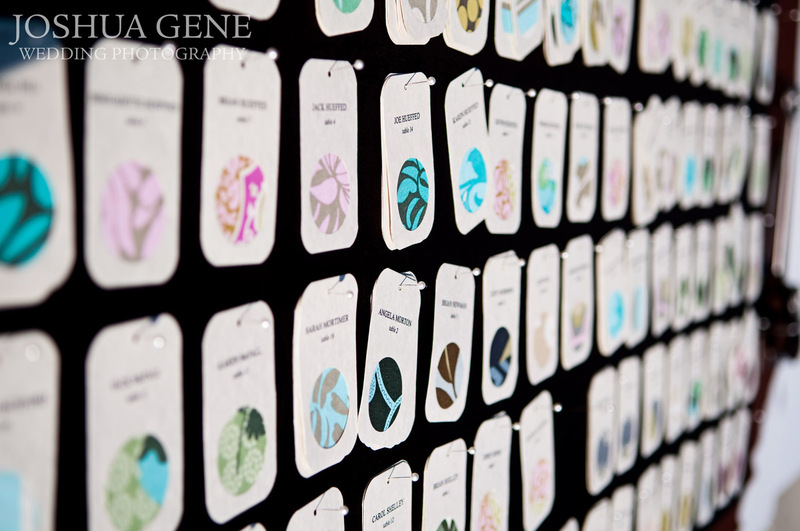 The place cards were then attached with straight pins to a foam core board which was covered with fabric. As guests came and picked up their place cards, the pins were pushed into color coordinated pin cushions. Centerpieces – Many brides will use a square beveled edge mirror for the center of each of their reception tables. So you already know this bride used the twenty-two different fabric squares for each of the guest tables. These served three purposes: 1.) Fabric squares were color coordinated with the guest place cards so each table was unique. These also echoed the wedding colors. 2.) Each served to be the base for the three potted plants that were the floral centerpieces for each table. All the plants, some flowers and some culinary herbs, were potted by the brides and friends before the wedding. The potted plants also served as an additional favor for guests to take home at the end of the night. 3.) The fabric squares were gathered up at the end of the evening and then given to an aunt of the bride. The aunt had promised to make a quilt of all the squares as a gift for the bride and groom, to be displayed in their home. Favors – These were a square two piece glass picture frame that doubled as a coaster. This bride inserted various pictures of her and the groom into these and tied them up with a ribbon. 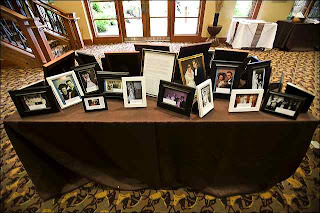 The picture frames gave the guests a dual use. One as a framed memento of the bride and groom and two, as a coaster which could be used for protecting their own tables at home from water marks. Guests, if they chose to, could switch out the picture later and color coordinate it to their home décor. Extra frames/coasters were available if guest wanted to have a matching set. · Use rental (reusable) items instead of buying new. 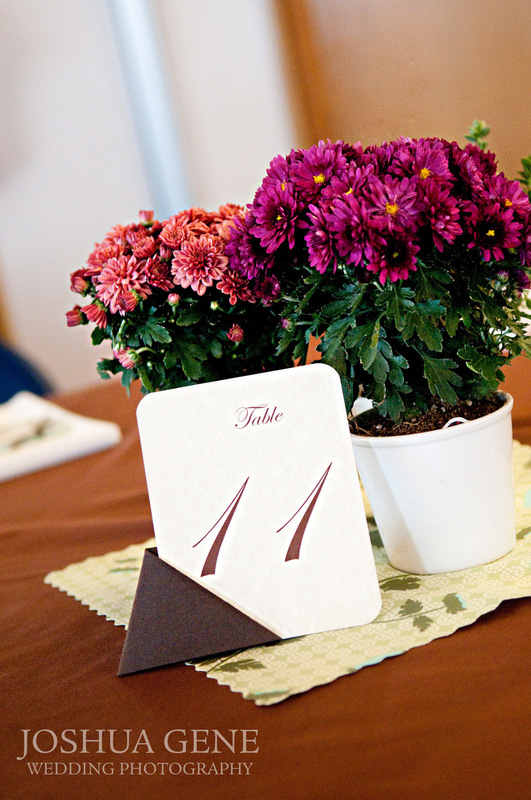 There are many local rental companies to supply you with table décor, linens, place card holders, etc. Or if you do buy items for your wedding that can be reused by someone else, there are websites you can list your items on to be bought and used again by another bride. Try Bravo Bride or Etsy for this. · Consider asking your floral vendor about which flowers are in season locally at the time of your wedding. Not only will it save you money but you will support local growers and reduce the carbon emissions caused by shipping flowers long distances. Use your altar arrangements twice - once at your ceremony and then have them moved to your reception and use them at your head table or on your buffet. This will save you money and reuse your arrangements. 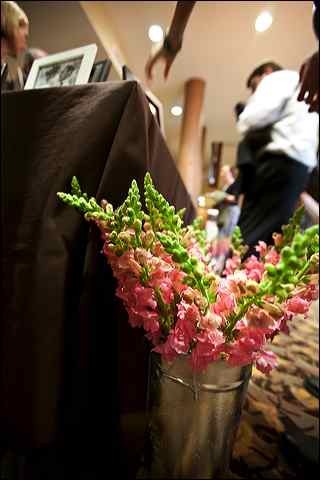 Bridesmaids’ bouquets can be placed in vases along the head table at the reception instead of doing more centerpieces. After your wedding, donate your flowers to a local children's hospital or an assisted living facility. 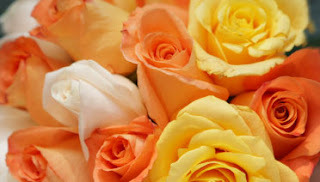 Your flowers will not only be used twice, but will brightened someone else's day. You might even be able to get a tax write off for the donation! · If you are not attached to saving and preserving your wedding dress, consider cleaning and selling it on Bravo Bride. Brides against Breast Cancer will also take wedding dress donations. Your bridesmaids can donate their dresses to Donate My Dress which benefits young ladies who cannot afford to buy a new prom or homecoming dress. If your bridesmaids love their dresses, they can consider having their dresses shortened to cocktail dress length and reuse their dresses for future events they attend. · Try to use local vendors whenever possible to reduce your carbon footprint caused by shipping items long distance. Supporting local businesses is great for your local economy and almost always costs you less to buy local and in season. Consider doing a carbon offset through a company like terra pass. Reuse a family member’s items from their wedding. A grandmother’s embroidered handkerchief can be used to dry your tears of joy or as a stem wrap for your bouquet. Your grandma will love you even more for using it. If your mother’s wedding dress was a classic timeless dress and close to your clothing size, you can have it altered to fit you. This is a lot less money than buying a dress new. This can be your something old or something borrowed! Here is a very simple cost effective tip you can utilize at the beginning of your planning. Find a venue that can hold both your ceremony and your reception. You save by paying for only one location for your wedding. Your guests save time and gas (emissions) by not having to drive from the ceremony to the reception. All your flowers can easily be moved from ceremony to reception. Give favors that are appealing and can serve a dual purpose. A program printed and made into a paper fan for a late summer outdoor wedding can be the program and a favor all in one and keep your guests cooler. OR consider a plant-able favor like a tree seedling in a mini terracotta pot that makes your guest tables look great and can be planted later and green your guests’ yards. Give favors that are very likely to be used by your guests after the wedding such as cookie cutters with a ribbon matching your wedding colors. So walk down the aisle in your white wedding gown but think “green” while you plan. Get Personal for your Wedding Day. Reception table personalization – Brides and grooms are always looking for ways to name their tables in a unique way that brings out the couple’s personalities. This bride and groom decided to name their guest tables after pets they had owned during their lives and after states one or both of them had lived in. This may at first glance seem hard to pull altogether, but it really worked. They had tables for a horse, a childhood pet of the bride. There was a table named after their pet cat as well as Washington state and New York state tables. 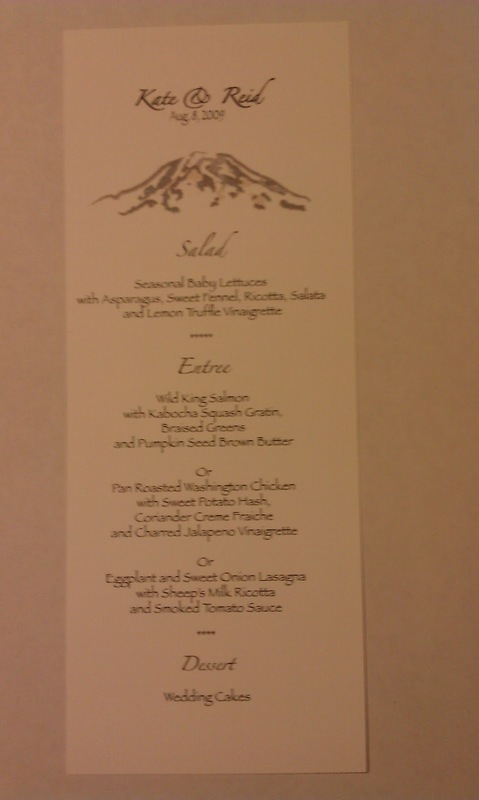 Menu Cards – Each table had a different menu card even though the menu was the same at each table. 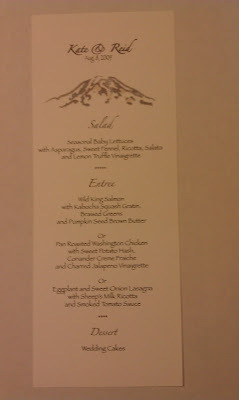 One side of the menu card gave the details of the salad, entrees and dessert. The other side of the menu card listed the name of the table, either a state or a pet. Then a short paragraph followed telling a story about the pet or the significance of the state to the couple. 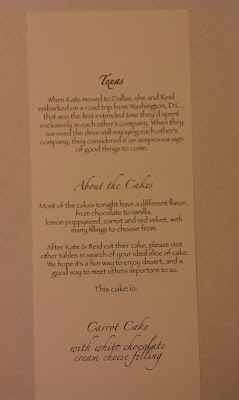 Then there was a section about the centerpiece which was a two tiered mini wedding cake. There were instructions to have a designated person at each table to cut the table’s cake right after the couple cut their own cake. Each table had a different flavored cake and guests were encouraged to visit other tables to find their favorite cake slice. 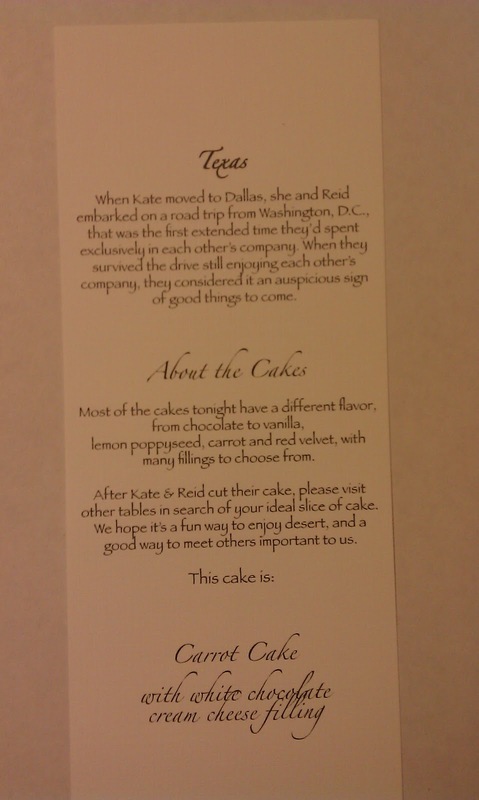 Favors – Can you guess what the favors were? Think states and pets! Each table had cookie cutters in the shape of that table’s pet or state. How cool is that!! 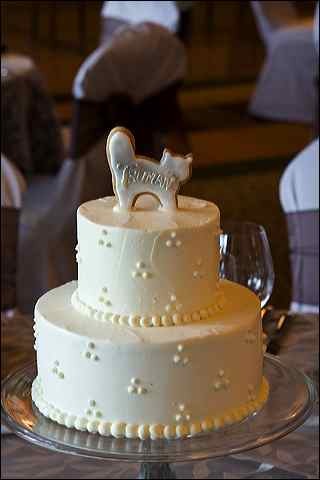 It gets even better when you know that on top of each table’s centerpiece cake was a cookie in that shape with either the state’s abbreviation or the pet’s name. On the head table was the Washington state cookie cutters as favors with a cake topper cookie in the shape of the state and labeled “WA”. Such attention to detail! ily and included in memory a missing family member. Very touching way to honor loved ones who could not be there! Wedding picture table – The final idea that I found so wonderful was a table of framed wedding pictures of family, friends and other relatives. The parents of the bride and groom had pictures from their wedding day along with grandparents, aunts, uncles and close family friends. This was done to honor and recognize the many long term marriages that this family had. The pictures were all dated and had the names of the wedding couple pictured. Some pictures dated back to the 1940s. One of the pictures even caught the eye of a random person staying at the same resort where the reception was taking place. This lady told me she recognized a woman in one of the pictures. She gave me the name and I checked my guest list. Unbelievably, this person (not a guest at the wedding) knew this wedding guest from two decades ago. After checking with the named wedding guest, a reunion ensued between the two women. This story still touches my heart. This couple took their story and their history and artfully incorporated these aspects into their wedding ceremony and reception. Think of special moments in your lives and share these stories with your wedding guests. These memories will create new moments for you as a couple and make lasting impressions on your guests. If you are planning your wedding and have questions or concerns, these workshops are for you! Every bride has questions and sometimes no one to ask. Come listen to wedding professionals with answers. The workshops are designed to help you learn to interview potential vendors such as photographers, florists, DJs, wedding planners, officiants, caterers, etc. The workshops will provide you with information to make wedding planning decisions with ease, choose the best wedding dress or wedding flowers for you, and connect you with wedding professionals with DIY solutions. Each workshop is a series of four 2 hour sessions with up to four wedding vendor presentations each session. Sign up for one session or all four. The first workshops will be held in Tacoma and Seattle/Tukwila starting in March 2011 . Future workshops are planned for Auburn, Gig Harbor, Sumner and other upcoming locations . $10.00 per person for each session through January 31, 2011. Starting February 1, $15.00 per person. Now that you are engaged, you are starting to think about where and when to have your wedding. You have probably already thought about how your dress will look and what colors you like for flowers and bridesmaid dresses. The venue you pick for your ceremony and reception will affect many other decisions. You can determine ahead of time what you want for color scheme and style of wedding and then find a location that FITS what YOU want. Do you want to have your ceremony and reception at the same location? How many guests will be coming? Do you want to marry indoors or outdoors? What time of year do you want to marry? What will the venue look like at the time of year you are marrying? Which plants, trees or bushes will be blooming at that time? What is the maximum capacity for the venue? What are the permanent colors in the space such as walls, carpeting, and maybe even the chair colors? Will these go with the colors you want to have or will the colors clash? For reception venues, do they have an exclusive in house caterer or do they allow other outside caterers to use their facility? What is included in the fee to rent the venue? Are tables, chairs, linens or their sound system included? Can you use the whole venue or only certain rooms? Do they have a preferred vendor list and do you have to use their chosen vendors? Your budget and timing for the day can be affected by all of the above. When you go and look at a few venues, ask lots of questions before signing a contract. If you would like a full check list of questions for selecting a venue, call or email me for a complimentary consultation. I offer many wedding services including researching and recommending vendors to brides.